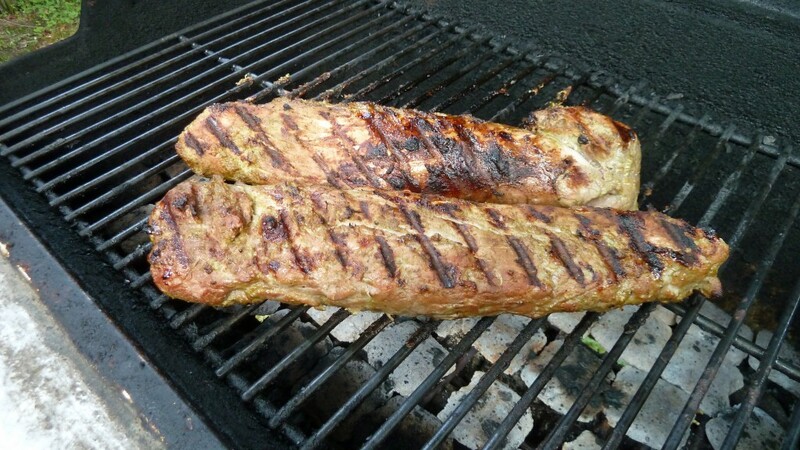 Last night for dinner I grilled pork tenderloins Caribbean Jerk style from a Sur la table* recipe. 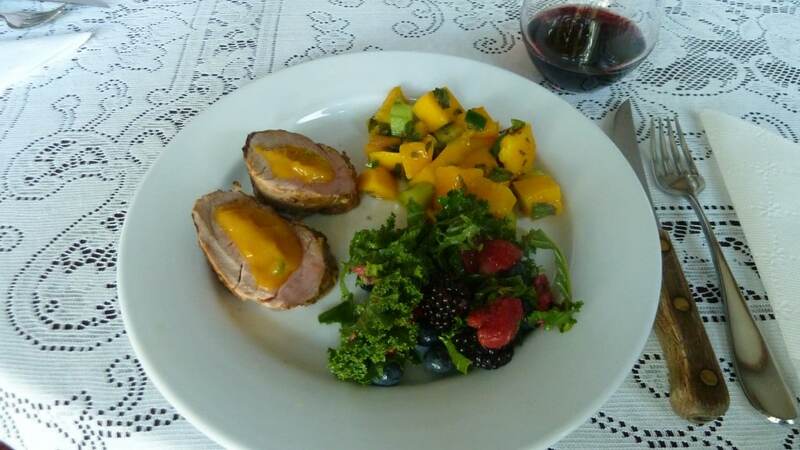 I served it with Mango Salsa and Kale salad with Berries. The pork was prepared the day before and marinated in Jerk Marinade overnight. You’ll need 2 one lb. 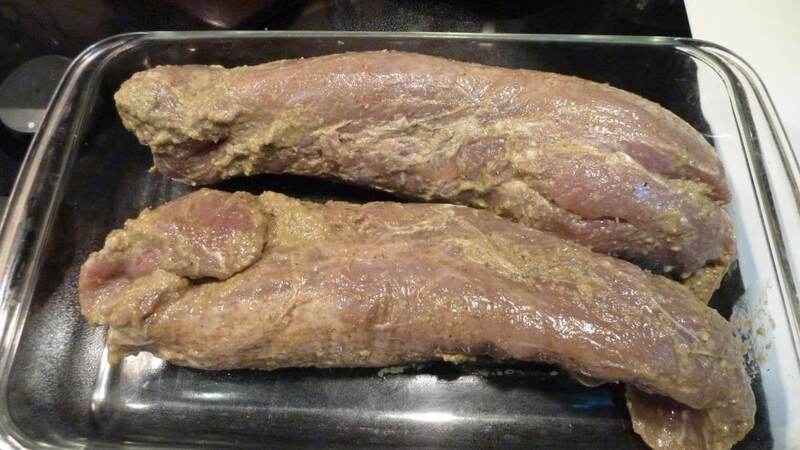 trimmed pork tenderloins. Jerk spices include 1/2 tsp. dried thyme, 1/4 tsp. cayenne pepper, 1 1/2 tbsp chopped fresh ginger, 1 tsp. allspice, 1/4 tsp. nutmeg, 1/4 tsp. cinnamon and 1 Serrano chili. 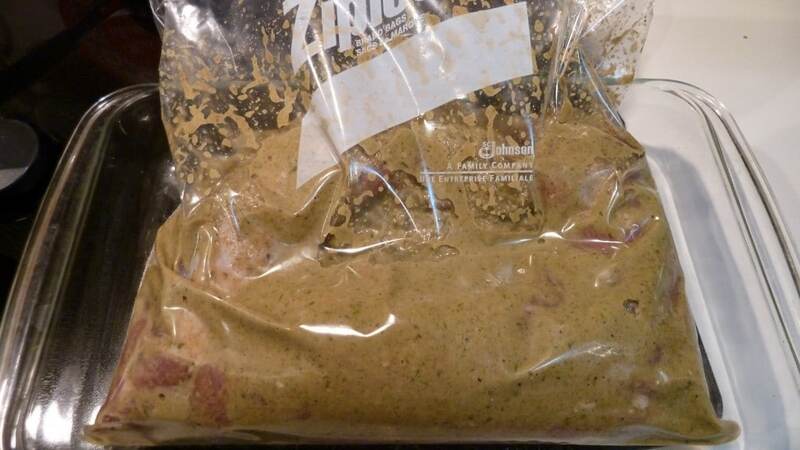 To prepare Jerk marinade combine the ingredients in a blender and process until smooth. 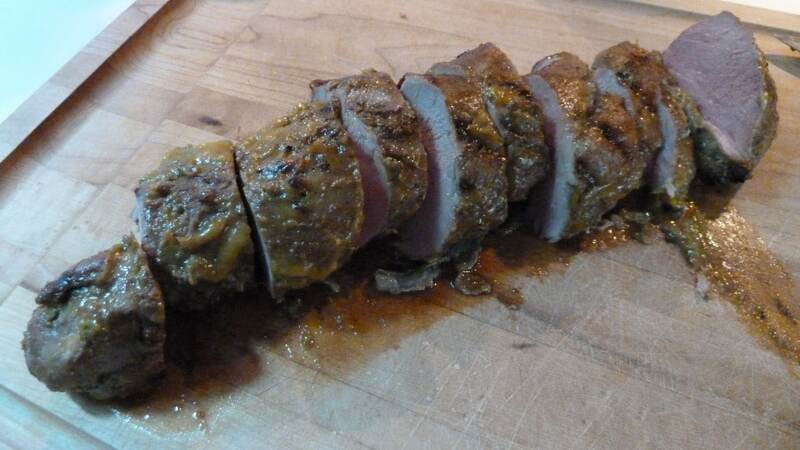 Place pork tenderloins and marinade in a plastic bag in a shallow baking dish, place in the refrigerator and let pork marinate overnight, turning occasionally to coat all sides of the pork loin. Before grilling remove excess marinade from pork tenderloins. 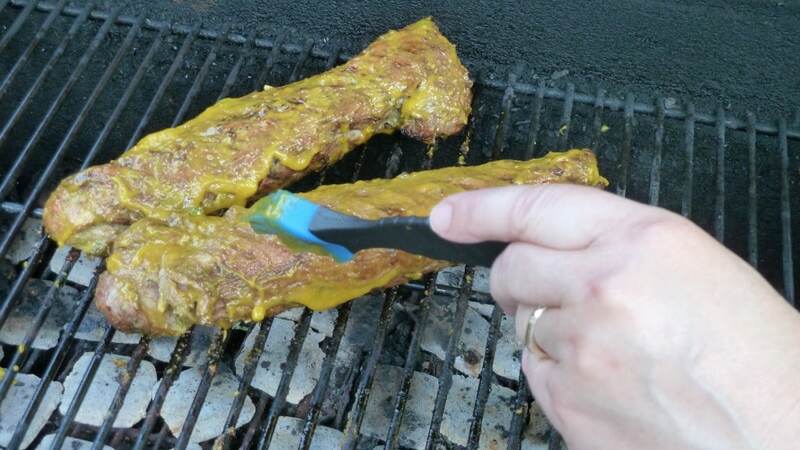 Place pork on grill, turning with tongs to brown and get nice grill marks on all sides. Cover and cook until a meat thermometer registers 135 degrees. 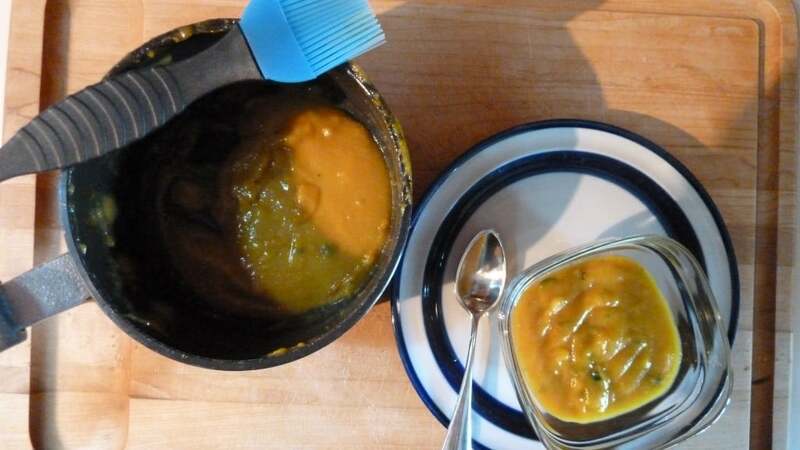 Place mango, sugar, Worcestershire sauce and soy sauce in a blender and puree until smooth. Heat oil in a small saucepan over medium heat. Add garlic and Serrano chili and cook, stirring constantly until garlic is fragrant, about 30 sec. to 1 minute. Remove from heat, salt and pepper to taste. Set aside and reserve half of the glaze to brush the tenderloins and half to serve with the meal. Brush the tenderloins with the glaze during the last 3 – 4 minutes of grilling being careful not to let the glaze burn. Transfer tenderloins to a cutting board with a well and tent with foil to keep warm. Allow tenderloins to rest for at least 5-10 minutes. This is a delicious way to prepare pork and the salads make delicious accompaniment. It’s half a world away from traditional Greek cuisine, but try it. You’ll enjoy it. It has an intense sweet and spicy flavor. *Disclosure: I am employed by Sur la table. I work as an Assistant in their Cooking School. I love my job. I get to work with great Executive Chefs and am exposed to recipes I might normally be reluctant to try. 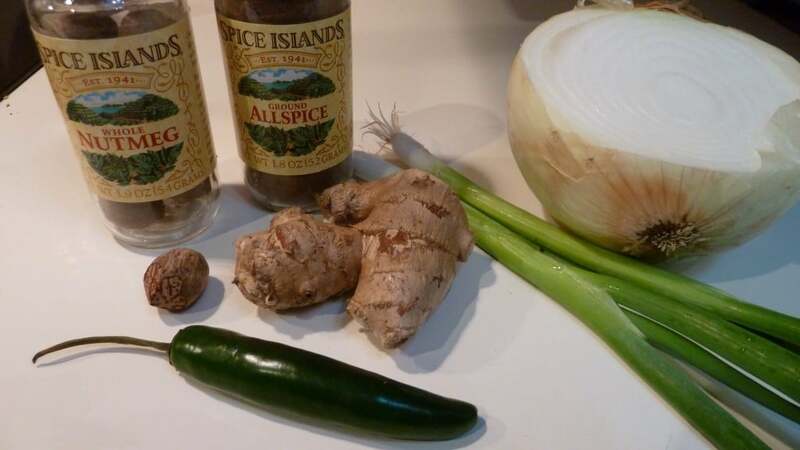 Their Warm and Breezy Caribbean Cooking class introduced me to this Jerk recipe and cooking with chili peppers for the first time.